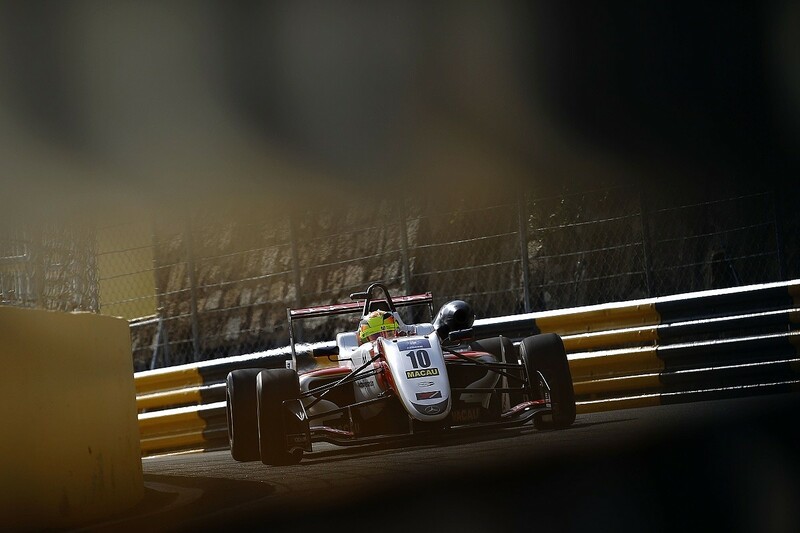 After an unconvincing rookie F3 season in Europe, Schumacher surprised some by qualifying as the top Macau newcomer in seventh place. In the early stages of the qualification race, he botched an overtaking move on Ferdinand Habsburg for sixth position, sailing instead down the Lisboa escape road and dropping to the back of the field. From 20th on the grid for the final, he was up to 11th before pitting with a gearbox problem while the safety car was out - Schumacher lost two laps while it was rectified and finished last, but set the fastest lap by over half a second. 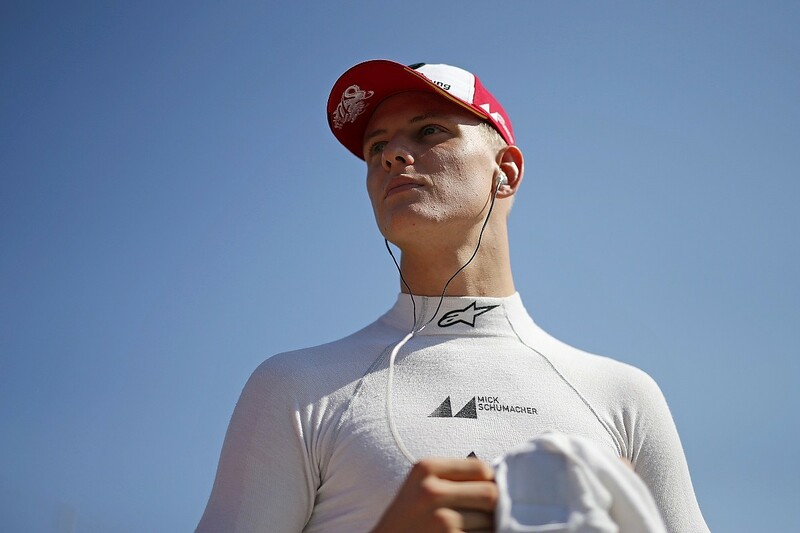 "The speed was there from the beginning," says 19-year-old Schumacher, now finally allowed to conduct one-on-one interviews with the media as he nears the end of his fourth season of car racing. "That shows really the potential we had, and Macau is not a track where you're not able to overtake - it's really easy to overtake there, especially on the long straight. "So I think my chance could have been to have a good weekend there. At the end we did - we had the quickest lap - but it would have been nice to fight for the first positions. Who knows, maybe I could have been somewhere in the mix." 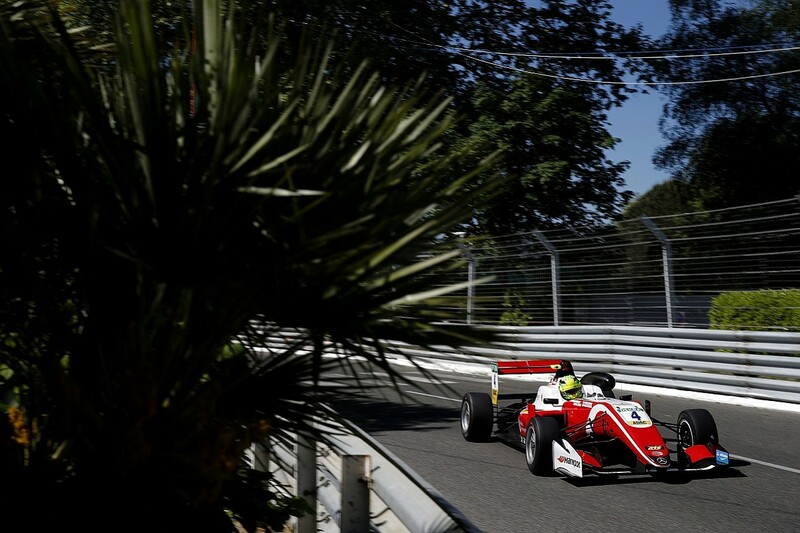 For Prema boss Rene Rosin, whose squad ran Schumacher to the runner-up spot in the 2016 German and Italian Formula 4 championships, Macau 2017 was also a sign that here was a driver ready to step up to the plate. "It was the first moment I say, 'OK, this guy is OK, he is ready for next year,'" says Rosin. "That time made me understand: 'Listen, he's a driver that we need to have next year.'" 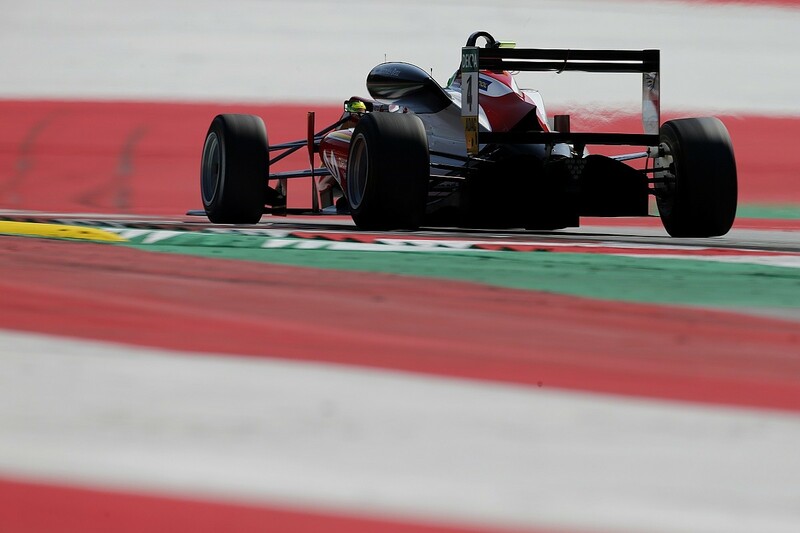 To be fair, Rosin is using a little bit of poetic licence here: 12 months ago, Schumacher's place for a second year in Prema's F3 line-up was already all but assured, and Rosin was even ordering a brand-new Dallara F318 for him - his hand-me-down F317 would be passed on to Marcus Armstrong for the following season. But you get his point: it's the distinction between Rosin's use of the words 'need to have' rather than simply 'would like to have to fill an extra seat and provide work for a few of our staff'. "Sometimes he was up and down in 2017," continues Rosin. "He had his first podium at Monza, and I think he did a good job for his learning year, but qualifying was always a bit tricky." Schumacher knew one-lap pace was his problem, and this was a major focus of his 2017-18 winter preparation. "Yeah, I guess it's a big step from F4 just because you have a lot more downforce; you have to really be able to push at 105%, because if you don't maybe you're a bit slow, which was maybe the case last year," he admits. "I really tried to do the best I could in every session, and maybe it was trying to be a bit too good, and therefore being a bit too conservative in qualifying. 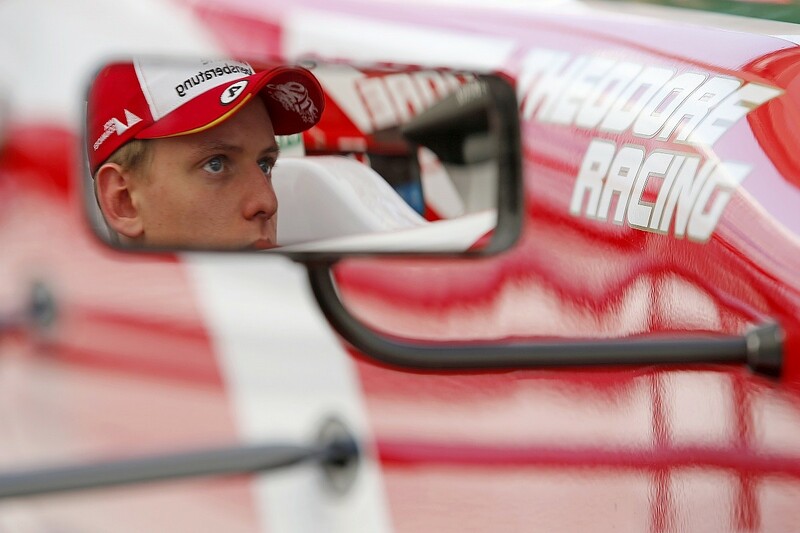 Whilst in the racing I just had the feeling... it was similar to F4 and to karting, just close fights and being there." 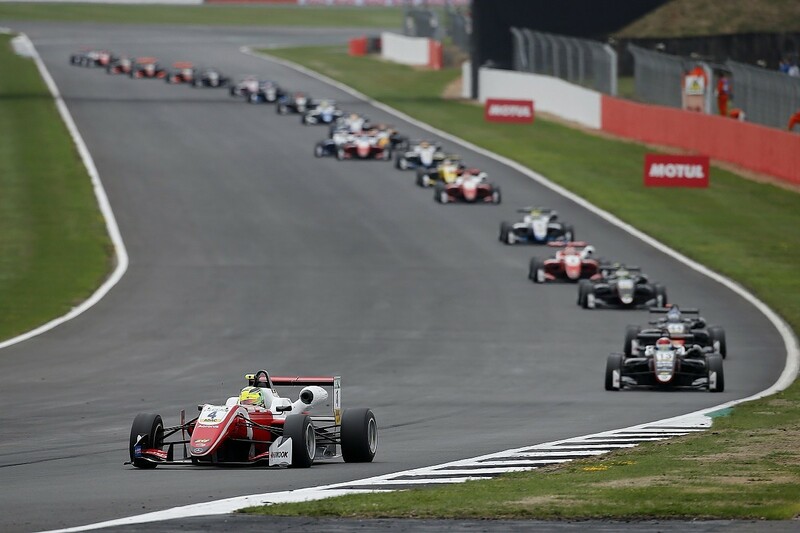 Racecraft is, indeed, one aspect in which Schumacher did excel in his rookie F3 season, and it's a skill he claims dates back to his karting days, which culminated in his fighting future F3 rivals Enaam Ahmed and Dan Ticktum for the 2014 World and European Junior titles. "I think that's something you either have or you don't," he opines, "and I just had that from the beginning in karting, where I was really able to quickly make decisions and be able to take also the right decisions. Karting was a bit of a closer battle, just because the track is smaller so you have to be more aware of who is going to have a spin in front of you, and put yourself in a place to make up the most positions." But in F3 it's much harder to pass than in karting, hence that requirement to sort out his qualifying shortfall. And, it has to be said, the evidence that this had been sorted was unconvincing during the first half of the 2018 season. OK, Schumacher topped free practice for the opening round at Pau, with a lap time that stood as the quickest of the weekend, but free practice is a different discipline to qualifying and, in the only dry qualifying session, a suspension breakage dumped him into the wall. "I have a lot to learn, a lot to improve," he says, "and seeing the performance that we did in the last three race weekends and even Spa [round five, where Schumacher scored his maiden pole position in F3], we really managed to put it all together. "That would have been the case from the beginning, because for example free practice at Pau we were three tenths ahead of everybody, and then in quali one I broke the suspension, which can happen - and we never really managed to show what we actually have until Spa." "We got the suspension failure at Statue Foch," adds Rosin, looking back to that Pau weekend. "And there started... I think we all created all together from our side, his side, a bit too much pressure maybe, and started getting back into the situation where 'I'm not able to do the quali'. "But this was not the case. We started talking to him quite a lot. There were mistakes from his side, mistakes from our side, some bad luck where weather conditions and so on were a bit tricky. 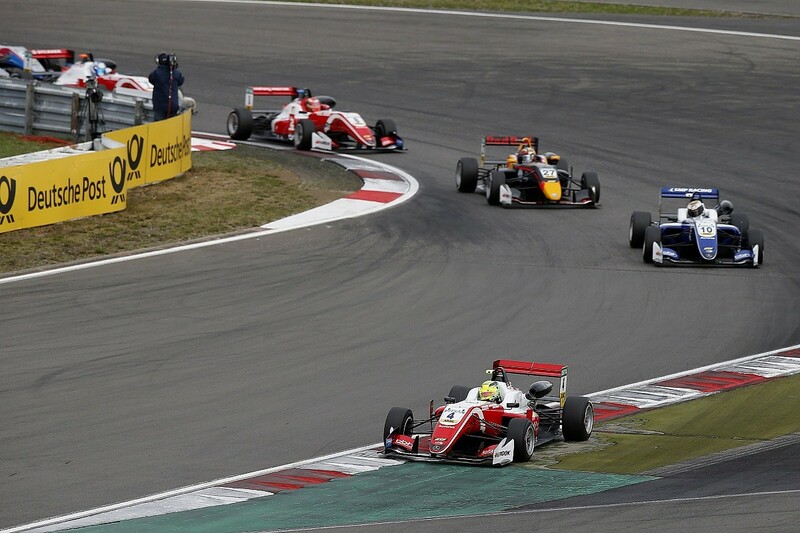 And then we arrived at Zandvoort [in July] fighting for good positions. "At Zandvoort we did a very good Q1, and in Q2 we got some issues in traffic and started back in the field. But really we started to see a change, which was there at Spa [at the next round], and from then on he understood - he took self-confidence in himself being able to do stuff. We haven't done anything magic. He just has done what has been his capability since the first race." The prelude to Schumacher's title-clinching steamroller run at the September Nurburgring and Red Bull Ring rounds was drip-fed wins at Spa, Silverstone and Misano. Spa was perhaps an outlier, with qualifying all about picking up a tow (he did that to take pole, but that race was ruined by a collision) and racing all about slipstreaming (which he did to perfection in the subsequent race to climb from sixth on the grid to score his first win). It was an appropriate venue for his breakthrough success, bearing in mind father Michael made his F1 debut and scored his first grand prix win at the venue. "Obviously it all started with Spa," says Schumacher. "Spa is a very special track for me and my family, and we were able to be constantly quick from there on." Then he adds, in a neat little stab at self-deprecation: "It was important for everybody. It shouldn't have happened that late - that's for sure!" The subsequent victories in August at Silverstone and Misano were perhaps a better barometer of Schumacher's genuine race-winning form, but Spa was unquestionably good psychologically. Does Rosin hold with the theory that this is, in such a closely matched category as F3, perhaps the most important part of a successful driver's make-up? "From my point of view it's a bit of a mix," he considers. "It's a bit of input and pressure from us because we want to deliver the results. And of course the results were not coming, and when the results are not coming you try harder, harder, harder. "It was a moment around Silverstone time we really sat down and said, 'Mick, we need to do the stuff as we are able to, as you were doing in the winter testing, as you were doing in the first weekend in Pau'. And then the last races have been amazing. He has done something very, very good." So amazing were the upturns in form from Schumacher and Robert Shwartzman - while simultaneously Prema team-mates Armstrong, Ralf Aron and Guan Yu Zhou struggled to get on the pace - that accusations began flying around the F3 paddock. "The rumours didn't help at all," says Rosin. "I don't want to name any names; I don't want to make any polemics, because that's not the way Prema wants to behave. If somebody has some doubts about our cars they just need to make a protest. There is nothing to say. I think if we are cheating this year, it's what we have done in the previous eight years. We've been checked quite a lot of times." Asked about title rival Ticktum's post-Red Bull Ring Instagram rant, Schumacher merely shrugs: "I really focused on my performance the whole race weekend, and we worked as a team very hard and managed to be quick. We were really happy that we were able to put the performance on the Tarmac." Whatever was or wasn't going on, Schumacher was doing a good job to control races from the front. The first time he did this was at Silverstone. Was it something that came naturally? "Erm, it was I have to say from the beginning a bit of a different feeling," he reflects, "because I'd never done it in F3. So maybe the first lap was a bit, let's say, 'OK, I'm first now, keep it there!' But then it started to get kind of easier with every time and every lap. "Now I take it as a qualifying session when I drive, and every race is a qualifying for me, so if I have to put the performance on the Tarmac I'm able to. And if I have to extend the lead I will extend the lead - I just have so much in reserve that I'm able to do that." Schumacher denies he is particularly strong in any one area. "Mmm, it's hard to say," he ponders. "Everyone is really quick, and the differences are so small in the end in F3 generally, that if you manage to put everything together you're most likely to be up there and be quick. It doesn't need to be three purple sectors - it just needs to be constantly quick." Rosin backs up that Schumacher is a strong all-rounder rather than being 'top of the class' in any aspect. "His dedication, his concentration, his capability on managing the race is a very strong point," he says. "Always being able to be in the right place at the right moment, I would say. He's good in everything, and if he's not good in something he tries to improve by speaking to the engineers and looking at the data." Meanwhile, his old karting pal and rival Ahmed, who has been with Prema's fellow Mercedes engine customer Hitech GP this season, has an interesting observation on driving style, which he offered after Schumacher took all three poles at the Red Bull Ring. "We get his data [the data of the quickest driver from each engine supplier is shared with all other customers] and I guarantee he's got no more power than me," said Ahmed in Austria. "He's just driving really well. He's got 180 degrees of opposite-lock on through the last corner in the dip there. We can't do that!" Interestingly, however, Schumacher's team-mate Armstrong was quicker through the start-finish line speedtrap, shortly after the final corner, in both qualifying sessions. Now that a contentious European championship season has finished, Schumacher bids to emulate his father and uncle Ralf by winning Macau at the second attempt. "I am first of all looking forward to the race weekend," he says enthusiastically. "It's just a lot of fun arriving in Macau, seeing all the Asian fans and everything, and the whole set-up and the whole race is just incredible. You have so many people cheering for you, and that is really nice. "On the track it's unbelievable - it's the best track I've ever raced on. You have quick corners, you have extremely slow corners, and you have passages where you have to go flat where you would think, 'OK, no way I would be able to do this flat!' And you have to be so close to the wall every time, every lap, to be quick. That's a really hard challenge. "You have to focus so hard not to make mistakes. If you're able to do that, you're quick. No word can express the feeling you get when you're driving the car." Schumacher is travelling with a "go there and see what you're able to do" mentality, which is probably the best approach to Macau. If he wins? There'll probably be a lot of people happy for him. Regardless of the accusations this season, he's a popular lad with a ready smile and a good attitude. "He's a normal guy just like the others, even with an important surname behind him," says Rosin. "He's part of the team - nothing special."